There are certainly a few more strips that hint at today’s big reveal, so why not put off that yard work and get to know the story so far? Really? The pupils are what you are drawn to? Haha! Yeah, they’ve always been there, I wonder if I need to enhance them a bit more. To be honest, I have no idea where the story is going to take us from here. We will just have to wait and see! Oh yeah, pupils. Huh. Weird, but interesting. Anyway, these are really great lately. 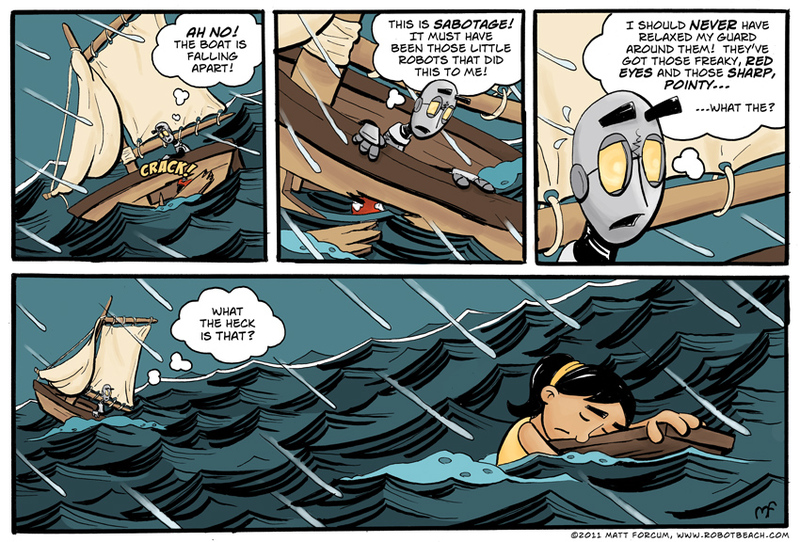 I’m so glad robot got out on the ocean finally, even if it comes at the cost of his personal safety. Can’t ever get anything done without a little risk. Cool. Thanks for the links around your comic! I haven’t had (made?) time to plumb your archives yet. That was helpful! Wow, the time of man has not come to an end. This opens up a whole new direction and questions for the island and what is going on just past the horizon. Very cool. Can’t wait to see where this is going from here. Whoah, I did not expect that, Matt! She looks great… very interested to see what happens next. I fear our hero may sink to the ocean floor. Yeah, now you and I can struggle with drawing the female of the species together! Hee, love the comments here. Forget the “Human” on the board, Robot has pupils! so I just noticed the pupils for the first time too…. and also, it should’ve been a boy in a barrel, just saying. Great one Matt, boy I tuned in just in the right time! I confess, I never noticed the pupils until that was mentioned here in the comments, either.